– Did the artwork arrive on time, and in good condition? – Are you pleased with the artwork, and is it as described? – Where did you find us? – Would you recommend us to a friend? I have had 5 pieces of art work from yourself and i love them all, they really stand out on the ward and the quality is wonderful. they are well wrapped so no damaged to the parcel , i love waiting for it to arrive so i can display it. I’ve just bought a third picture from Jan Rippingham. Jan is more than happy to accommodate any changes you may wish to make and adapted the last one (Two Vases) to coordinate with a previous purchase so the size and colours complemented each other. I really like Jan’s painting style and the colours are perfect for my home. The artwork arrived in very good time and in good condition. We put it up in our lounge immediately and had many good comments about it over the Christmas period. I found the website through general browsing. I knew I wanted a picture and your website was clear, user friendly and you gave accurate measurements. I also appreciate the lack of hard sell. I rejected one site because they constantly hassled me! The service I have received on a number of occasions now has never dropped below excellent. I had a specific request answered promptly and would not hesitate to recommend anyone looking to purchase artworks to take a look at the website. Did the Artworks arrive on time and in good condition? They did, even sooner than expected. · Are you pleased with the Artworks, and are they as described? Very much so, and you described them perfectly well. · Where did you find us? A friend recommended your gallery. · Would you recommend us to a friend? Very smooth deal/ Thanks again ! The service we received from Rippingham Art Ltd was second to none. At every stage from the very first email to delivery of the painting, Jan was incredibly helpful and we are absolutely thrilled with our amazing artwork. Thank you Jan! I highly recommend purchasing artwork from Rippingham Art Ltd. As a repeat customer, I have purchased several paintings from Jan Rippingham and with each purchase, the customer service was excellent. My new artwork arrived promptly and packaged securely. The best part is the lovely and original artwork that is hanging on the walls of my new home. Absolutely beautiful! I bought Abstract Floral 9 from Jan Rippingham’s collection in a size different to the one advertised. I emailed Jan to check that she could reproduce it in the size I wanted and to get a price. I received a rapid response, placed the order via email and received the painting a week later, having paid on line. Easy to do. Jan adapted the picture so the size I wanted perfectly. So I’m very pleased with the result. A lovely range of work for everyone and very reasonable considering the quality of the works. Fantastic speed in delivery too! Easy to use website with interesting info about the artists. Quick delivery and the prints were better and larger than I had anticipated. Hello, I bought a beautiful picture from yourselves and am extremely pleased with it. Everyone who comes into our home admires it. It was very easy to buy from yourselves. The picture is lovely and the packaging was done so carefully and well. Very happy with the service. The picture is wonderful and absolutely looks like an original. The colours are amazing. The only negatve thing is I asked them not to post it until a certain date, because I knew I wouldn’t be in. They posted it regardless! I am delighted with the print – it is even better than I had expected and I shall certainly be interested in purchasing others from the same and other artists in the future. I found you just by browsing for art online and yes, I would recommend you to others – indeed have already done so. Lovely picture as shown and described on the website, delivered promptly. I recently bought a print of the ‘Velveteen Rabbit’ for my granddaughter. It arrived quickly and was carefully packaged. I was delighted with it. I have bought two of your own works in the past so I am not a newcomer to Rippingham Art. I frequently browse the site and enjoy looking at the art work. I was pleased with the artwork received. Great artwork. Nice website, easy to navigate and excellent service. My picture was delivered very quickly, & was securely wrapped to prevent any damage in transit. I loved the picture, and it has had many compliments. It was very easy to order from the website and my print arrived well packaged with framing instructions and in good time. The team were in contact throughout the purchasing process and the artwork arrived when expected and well packaged. I will be buying from Rippingham again in the future. The canvases are lovely and arrived quickly. Prompt delivery of order. Well packaged picture, but packaging not excessive. Painting exactly as described. From the fortunate discovery of Rippingham Art’s excellent and absorbing website I purchased 2 of the paintings displayed on the website and subsequently through an exchange of friendly emails with Jan Rippingham ordered a further 4 special commissions. Following receipt, I have been entirely delighted and impressed with the artistic excellence of all of Jan Rippingham’s paintings, together with the exceptional value and the very efficient service throughout provided by her support team. The paintings now displayed have greatly contributed to my modern home and have been equally appreciated and enthusiastically commented on by my visitors. E.A. from London has purchased several artworks from us. Really excellent personal service from Rippingham. I’d had problems with my internet connection on a Sunday. I’d more or less decided to give up, when I got a call out of the blue from them to see if they could help sort it out. 10 minutes later one happy customer – five days later brilliant artwork arrives. Thank you. We saw a painting we liked by Jan Rippingham that had been sold. We asked Jan if she could paint us another with the colours slightly altered.. Jan sent us photos along the way and was more than happy to make alterations until it was the way we wanted. It only took a few weeks. As soon as it was finished it arrived swiftly and was extremely well packaged. We are delighted with it. I was very happy with the painting I bought. It arrived on time and in good condition. I also emailed to check on delivery and received an extremely prompt reply which reassured me all was ok. I would definitely recommend Rippingham Art. P.S. from Hertfordshire purchased several artworks from us. Very happy with all the artworks purchased from you, I found your website by trawling through the web looking for original artwork rather than copies or prints. I would definitely recommend your website to friends and family members and will in the future buy from you again. All the artworks have arrived well packaged without any damage. Did the Artwork arrive on time and in good condition? – Yes, no delivery problem. · Are you pleased with the Artwork, and is it as described? Yes, the picture was framed and hung within 2/3 days. We will revisit the site from time to time. The artwork arrived within 48 hours of the order so we were absolutely delighted. The painting was beautiful as described and the artist even wrote a personal card to us which was a super touch. We found you on google and would not hesitate to recommend, superb service, thank you. · Did the Artwork arrive on time and in good condition? It arrived quicker than I expected it to! · Are you pleased with the Artwork, and is it as described? I am over the moon with the Artwork and it is exactly as described. · Where did you find us? I did a Google search looking for artists who paint flowers. · Would you recommend us to a friend? Absolutely, I already have! · Other Comments: The customer service I received from Rippingham Art was excellent. Thank you for your email. I purchased the pottery for a friend as a present, although after seeing the pot, I would have gladly kept it for myself! The pot was well wrapped and it arrived safely. I bought the pot on line after completing a Google search, I will be visiting your website again once it is my birthday! · Other Comments: – I purchased the Raku bottle as a gift, it was delivered in good time and very well wrapped in bubble wrap and fragile tape. Further to your email please see below my answers to your questions. 1. Did Artwork arrive on time and in good condition – Yes, We received the painting very quickly, it was well packaged and in good condition. 2. Are you pleased with the Artwork and is it as described – We are very pleased with the work, it was as described and a good likeness to the picture on the website. 5. Other comments- This is the first time we have bought a picture over the Internet and have found it to be a very positive experience. We are looking for more pictures as have recently moved into a new house and will keep checking your website as we would happily purchase from you again. The artwork arrived in great condition and in good time. I found your site via Google search. The artwork (prints) were as shown on your website. I would recommend your site to friends. The painting is truly beautiful, so much better than anticipated, the colours are so vibrant I am totally blown away with the end result. Please pass on my thanks and gratitude to Amanda for taking on the commission and to mention that I will be back in the New Year (or before) for more!! Thank you for all your help and assistance with liaising with Amanda, very much appreciated. Wouldn’t hesitate in recommended your to all..
D.C. from Lancashire purchased the sculpture ‘Firestone’ by Michael Crook. “Firestone” was purchased for a specific location in our home, it looks fabulous. The colours are vibrant, the texture of the wood amazing and the craftsmanship is excellent. We have received many wonderful compliments on “Firestone”. E.C. from Glasgow purchased several artworks from us. I found the whole experience of shopping at ‘theartonlinegallery.com’ to be extremely easy. All items ordered arrived on time and in excellent condition with the exception of one, which the delivery carrier put a hole through – this was dealt with quickly & a replacement was sent out. The mark of a good company is how they deal with issues when things go wrong. I am very pleased with my artworks & they are as described. We found you when browsing online. We would definitely recommend the website to a friend. Thank you for all your help. F.D.S from Surrey purchased ‘Atlantic Crossing’ by Sharon Deegan. · Would you recommend us to a friend? Yes, already have done! · Other Comments: All great, thank you. Did the Artwork arrive on time and in good condition? · Are you pleased with the Artwork, and is it as described? Yes the painting looks exactly as it did in the photographs. I found Rippingham Art on Google and was a bit nervous about buying original art online as I usually like to see something before buying. I would definitely look at your site again if I was looking for a particular subject or theme. A.B. from London purchased the sculpture ‘Embrace’ by Renate Altmann from us. Did the Artwork arrive on time and in good condition? Absolutely yes. · Are you pleased with the Artwork, and is it as described? Absolutely yes. · Would you recommend us to a friend? Absolutely yes. · Other Comments: I was very impressed with Jan’s responsiveness and helpful attitude, it made this purchase an easy and fun thing! the artwork arrived on time and in perfect condition. We were extremely pleased with the picture and the vibrancy of the colours. Dear Jan, the project you are running is brilliant. The choice of artworks is broad, the service is efficient, and I will certainly be recommending it to my friends. Thanks for our recent purchase from you – Silver Birch Trees. We love the piece, and it takes pride of place in our living room. Your website is fantastic in that it accurately depicts each piece of artwork, and gives examples of what it might look like in an actual room, a really good idea as sometimes it’s difficult to imagine scale. On arrival, the artwork was therefore exactly as we expected. It was packaged very well, and in perfect condition. We found your site by doing a general Google search. I only had a vague idea of what I was looking for with regards to style etc, and I actually spotted this piece on another site. However, I found that your site gave me a better idea of what it might look like in my room. This is the first time I have ever bought any artwork online, and I would not hesitate to purchase from you again, or recommend you my friends and family. The artwork arrived in the estimated time frame, in good condition. Yes, I am pleased with the artwork, it was stunning. This was the first time that I had commissioned any artwork, so I was a bit apprehensive until I got to see the paintings when they were nearly finished. I wasn’t apprehensive about the quality of the paintings as I have several of Oleg’s paintings. I was apprehensive that the paintings wouldn’t be quite as I imagined. Well – they weren’t as I imagined they were much, much better. I really am delighted. The service from yourself was excellent, speedy and informative. yes the painting arrived in good condition and was as described. Took it to be mounted and framed and chose a nice coppery colour frame which really complements the painting. It now looks great hanging in my hallway and really adds a contemporary splash of colour. I found the site via a google search for original art and would definitely recommend the site to a friend. I will also be browsing again in future. Yes the painting did arrive on time and in good condition. I am extremely pleased with the artwork and is exactly as described and depicted in the photographs. I was just browsing the web and came across your site – it must have been easy to use as I had no intention of buying anything but you have such a choice of styles/artworks that I browsed for ages and just HAD to buy Jill Bustamante’s painting . I was a bit nervous of spending money on a painting online but my dealing with you was an effortless & very pleasant experience & I was touched to receive a Christmas card from the artist ! I would certainly recommend Rippingham Art to my friends. Thank you. I am very pleased with both and although they were as described on the website, the real pieces exceeded my expectations. The artwork was received on time and in perfect condition and very expertly packaged. I came across the website by browsing available original artwork in Hampshire. I certainly would and have in fact already recommended Rippingham Art to friends and colleagues. I will be revisiting the site myself on a regular basis. I am very pleased indeed with both the paintings by Mary Kemp that I have purchased from you at Rippingham Art. They both arrived on time and were exactly as pictured on your website. I have written to Mary to let her know how much I like them. I would definitely buy from you again and recommend you to friends. I think you are providing a very valuable service to both the artists and the public who want to buy original work. I loved the painting ‘Forest 2’ and it looked the same as it was described. It arrived on time and actually sooner than I thought it would. I found your website just by researching paintings.Yes I would recommend to friends and family as your paintings are lovely. You just need to be quick in purchasing one as they seem very popular. Thank you for creating a wonderful painting as I can’t stop admiring it. J.F. & L.F. from Surrey purchased a commission by Oleg Riabchuk. We couldn’t be more impressed with the piece that Oleg delivered. 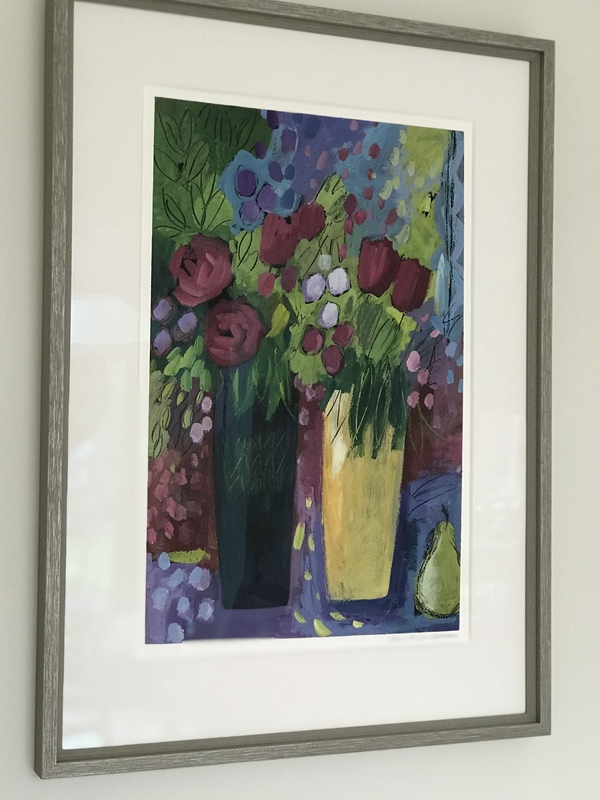 With it being the first piece we had commissioned, we were a little sceptical as to whether our specific requirements would be met and we were both delighted with the piece – so much so that we have now spent months trying to determine a frame beautiful enough to complement it! We will also be returning for more works in the future. Seascape arrive in perfect time and well packaged. The artwork is completely beautiful. I am hugely impressed with your work & service and will certainly be buying from you again in the future. U.S. from Essex purchased ‘Poppies’ by Oleg Riabchuk. looking at the artwork on your site! Thank you so much to you and of course the artist! L.C. from North Yorkshire purchased ‘Selcouth’ by Alison Johnson. I was delighted with the painting, which arrived promptly and in good condition. We wanted it for our apartment in Spain and it looks great there. Thank you. I would recommend you to anybody looking for paintings. The Artworks arrived on time and were in good condition being extremely well packed. I am more than pleased with the Artworks. They are as described, but look so much better “in the flesh”. I am re-vamping the house at the moment and will certainly purchase more art from you at the appropriate time. Yes, arrived on time and very sturdily packed; thank you for that. Delighted with the painting, and it looks good hanging above a bed, in the sunny loft conversion room. I found you by keying in ‘contemporary art’ in google. Would definitely recommend you, and already have! What swayed me into buying the picture, was the photo you had of it hanging in a room above a fireplace. I was able to get an idea of the size from that. Renovations to the house are ongoing, but will be back buying more artwork from you in the future, when we finish another room. Hello Jan, this was the second occasion I have purchased artwork from you. On both occasions I have been very happy with my purchase. The artwork arrived when anticipated and in good condition, it was as described online and I would be more than happy to recommend you to a friend. Never having purchased artwork online I was a little aprehensive. however I am extreamly impressed with the very efficient service I recived. The artwork arrived at the arranged time in great condition. It is always going to be a challenge visulising big pieces in particular, however your impressions showing an indication of scale were of great value. In fact the original was far better and I was delighted with my choice. I found your gallery by chance whilst browsing trying to find painting by another artist. I have already recomended you to a friend and will keep looking out for new pieces from you for myself. Cowes 2 arrived extremely well-packaged, very flat. We are delighted with the picture – it has caused a good deal of discussion amongst our friends and family. 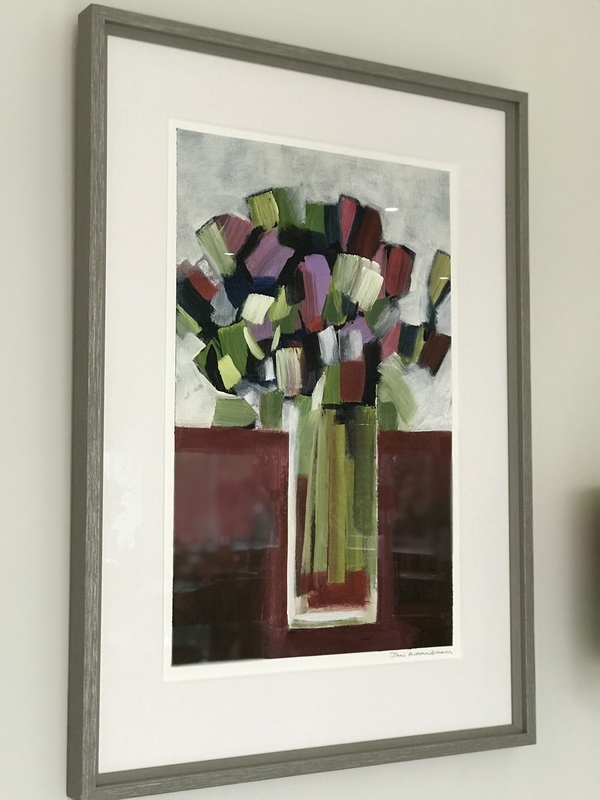 We have had the work mounted and framed with a mid grey wooden frame and slightly paler grey mount as we felt this let the colours zing! My only criticism is that the picture didn’t fit an “off the shelf” standard sized frame or mount, but I felt, in the end it was worth the extra cost of a professional’s handiwork! I trawled the internet and eventually found you and your site. I would certainly recommend your work to friends and family as it makes original art accessible at reasonable cost. I know that the piece I have is unique and absolutely suits my taste. I love it! It is situated in my sitting room where I can see it every day. I love the colours, the movement of the sails, the melee of the race – please don’t make any more exactly like mine as I just want it for me!! Thank you for your email. Service was terrific and I am happy to inform you that I’m very pleased with the artwork and that it arrived well. Vibrant tulips arrived on time, in perfect condition and looks even more vibrant and beautiful in the flesh, glorious colours and texture. I found the website via Ask Jeeves and would most definitely recommend yourself and the website. S.H. from Norfolk purchased ‘Cornflower Blue Bay’ – a commission by Michelle Carolan. Just a quick line to tell you that Cornflower Blue Bay arrived safely yesterday. I am delighted with the painting and would ask you to pass on my thanks to Michelle Carolan. Many thanks for the prompt and efficient manner in which this purchase was handled. I just wanted to confirm that I received the picture in perfect condition, thank you for your speedy service and I love the high quality art on your website. Thank you! The print arrived quickly and I am very pleased with it. Purchasing from the gallery was very easy and I would certainly do so again. I purchased a commissioned painting “Times Square II from artist Lee McCarthy after I made an enquiry online. Jan was extremely helpful from the outset and couldn’t do enough to help me. As this was a purchase for my friends 40th I wanted it to be a special gift. Throughout the whole process I was kept up to date with how the painting was coming along and once it was completed I was emailed the picture to make sure it was what I wanted. It arrived promptly and well packaged. My friend is delighted with it and so am I. I will definitely be making purchases from you in the future. It’s very hard when you are making a decision on such a personal purchase but I didn’t feel at any stage if I wasn’t completely satisfied I would be left purchasing something I didn’t want. Thank you so much for such a wonderful painting and great service. C.B. From Lancashire purchased ‘Blue Lagoon’ by Lesley Blackburn. Art work arrived on time and was in good condition. We are very pleased and it is just as described. We found you on Google and ploughed our way through many pages before settling on a few and finally Blue Lagoon. Yes we would recommend you. The Artwork arrived on time, one was in good condition, the other unfortunately was slightly damaged but this was rectified immediately. We are very happy with the Artwork, just as described. We found you via an online google search. We would definitely recommend you and would look to use the company again when more Art is required. A.F. from Dorset purchased ‘Passion’ by Marc Riley. Thank you very much for the lovely ‘Passion’. It was a perfect present for my husband for our 10th wedding anniversary and looks amazing in our smart sitting room. Thank you! A.S. from Dorset purchased 2 ceramic pieces from us. The painting was a gift and my wife is very pleased with it. I came across your website while surfing the net for original art work. Great variety of work is available and we would certainly recommend your website without hesitation. Thank you so much for the prompt delivery of my painting which is now hanging in pride of place in my dining room. I’m absolutely thrilled with it, it looks fantastic and makes me smile each time I look at it. “Busy Street in the Rain” arrived this morning, beautifully packed and in perfect condition. We are both absolutely delighted with it, So thank you, both for the painting and for the very efficient service you and Graham Williams have provided. I now have three beautiful paintings that make me smile every time I wander into a room. Pass on my thanks also to Jan, its been very easy and pleasurable purchasing! The artwork arrived promptly, was in perfect condition and I absolutely love it, thank you. I found you on the web and would definitely recommend you to anyone. I will be buying other pieces from you in the future. A.G From Kent purchased numerous artworks from us. Really love the website as well by the way. It’s been a great way of us getting wedding presents we really like – we gave our friends a list of the paintings we like and because they are all original it meant that we couldn’t get two of anything. Anyone who wasn’t sure got us vouchers which really helped as well. It’s been brilliant. We’re delighted with the service provided and would recommend Rippingham Art to anyone wanting to get beautiful, original artwork. Yes, all very good. I was particularly impressed with the extremely efficient way that the Artist ensured her work was delivered. Please convey my thanks. Many thanks for the opportunity to give feedback. I found your site via google searches and very happy that I did. The piece is excellent and much better than I could have hoped for and it is really great to have an original piece of art in the house. It was for an anniversary preasant and it was the perfect one. Your service was excellent. The website is quick and the purchase easy to make. I appreciated your follow up calls to confirm delivery. The item came on time, well packed and safe. The artwork arrived on time & was delivered carefully. I would definitely recommend you to others as you were very helpful and easy to deal with. The picture is lovely and was a gift for my husband who very much appreciated it. I am delighted with the painting. I have in fact just had it framed which I think sets it off to greater effect. To answer your questions …..
All artworks arrived very speedily and were excellently wrapped. They’re all beautiful and exactly as described. I’m very pleased with them. paintings now from the site probably says it all! I was very pleased with “Fishbones &Boats”. I bought it for my daughter as an anniversary present and she was thrilled with it. Several of my friends saw the collage and were very impressed so I would always be glad to recommend your work to them. Perhaps I might even be able to have a piece of your work for myself one day soon! yes as a customer the level of custom was very satisfactory. the artworks arrived on time and in great condition and I was very pleased with them,i would recommend your site to a friend and hope sometime in the future to return. Yes- very pleased with purchase! It arrived very quickly and was just as it appeared on your website. The pianting was nicely wrapped up forProtection as well. I had found your website online as I had been looking for a painting for quite a while. Your site is nicely done, it offers lots of information and lots of choice. Have recommended you to friends and will continue doing so. I am delighted with my two prints and in reply to your questions, the answer to all is ‘yes’. What I would like if possible is to find out where in the world is ‘Pink Bay’? Thank you so much for facilitating my purchase of artworks by Fiona Robinson. Your web-site is a pleasure to wander through, making it so easy to buy affordable art by superb artists. Any queries I had were easily sent to you, and you answered promptly and courteously. Thank you! You very quickly contacted the artist on my behalf, and she in turn responded promptly. I am very grateful that she was happy to fulfil my request for commissions. The artist respected my rather specific delivery instructions, and upon receiving the artworks, I noted that they had been very carefully packaged, ensuring their safe arrival at my door. I am extremely delighted with the artworks themselves!! Fiona is a very talented artist who seems to take a great deal of care with her work. The artworks on the whole are striking, and the detail within is amazing. I am very, very proud to be able to display such beauty within my home. Thank you once again for the part that you played in allowing this to happen. I will no doubt return to your web-site the next time that I am considering buying more artwork. Yes to the first. Yes to the second. Third, I’ve used you before, of course, but originally found your website through black swan galleries in Congleton, Cheshire. Yes I would, and indeed have, recommended you to friends. S.M from Essex purchased ‘Autumn Mist in the Woods’ by Aisha Haider, and ‘San Giorgio Maggiore’ by Jan Rippingham. The artwork arrived promptly and well wrapped. I am extremely pleased with the work and it looks better in real life. I found you on line through Google, actually searching for galleries to visit. I would definitely recommend you to a friend, in fact, my family have already been told! Best art gallery web site I found! Many Thanks. I’m sure I’ll be using you again. T.G from Oxfordshire purchased ‘Working Narrowboats’ by John Lowerson. The painting arrived today, and is wonderful. I wondered about buying art online, but your returns policy gave me confidence. The watercolour exceeds my expectations – it looks even better than it did on the screen. It is just what I have been searching for. N.B from Lancashire purchased ‘Summer Morning’ by Oleg Riabchuk. -The artwork arrived within 4 days of placing order and in perfect condition – excellent service. -Very pleased with the painting, the website photograph doesn’t do it justice!. – Excellent site offering an extensive range of art which is easily accessible – only a ‘click’ away. P.Q from Suffolk purchased ‘A Place to Dream’ and ‘Memory Tree’ by Jean Tatton Jones. My purchases have just arrived (only 2 days after I ordered them) and were in pristine condition. They are beautifully presented and along with the certificate of authenticity, I received a personal greeting card from the artist. I am delighted with my experience of shopping with you and with my purchases. I’d like to say a huge thanks and I shall certainly be making recommendations of your website. Best wishes for continued success in the future. S.M from Surrey purchased ‘Surrey Hills’ by Jan Rippingham. We’re so please with ‘Surrey Hills’ which is perfect and everything I had hoped for. On the whole I think your site is fantastic, very user friendly and the option to see the painting ‘in situ’ makes all the difference. · Did the Artwork arrive on time and in good condition? The Artwork arrived quickly as promised and was professionally packaged. · Are you pleased with the Artwork, and is it as described? The Artwork was true to the description and is more stunning when you see it ‘for real’. I’m really happy with it. · Where did you find us? I found you via google having trawled through a myriad of contemporary art sites. Your site has an excellent variety of styles and prices and I shall definitely look to purchase again. · Would you recommend us to a friend? Absolutely. · Other Comments: I like the look and feel of your web site, the descriptions and information about the artists is excellent but one thing I would like is the ability to select the number of images shown in a page as if I want to look through a large part of the collection there are far too many pages to select. I also wonder whether you have considered discounting for more than one purchase, either in a single transaction or over a period of time which would build loyalty (and revenue) for your gallery and a benefit to the purchaser. I am very interested in Alison Johnson’s work – I just need to save….. Yes, the artworks arrived in excellent condition and I have them displayed at home – they look absolutely wonderful. I have a great pleasure looking at them when I am cooking (both “meadow” and “apples and pears” are displayed in my kitchen/dinner) and “tulips” are in the living room and I can even see their reflection in the mirror which is on the opposite wall. I could buy some more but I have no available space to display them. It arrived on time and in good condition. It is as described and I am very pleased with it. I saw it on the net and have received favourable comments from friends who have seen it in my new flat. Thanks. I am happy to own the paintings and to decorate may house right now. And I still keep to watch the new artwork of you on the RA. Dear Jan, I was very pleased with all aspects of your service. The piece came in good time, with excellent wrapping. The piece is beautiful, and just as it looked on your site. I found you on Google search, and would not hesitate to come to you again in the future.